Place the "fo.exe" file provided with NEOTK into your find_o64 directory. This is a beta feature, and may contain bugs. 2. Pick an asteroid with a relatively short arc. Ive found rocks with an arc over 10 days do well. 3. Download it's observations from MPC or wherever, and load them up with findorb. 4. 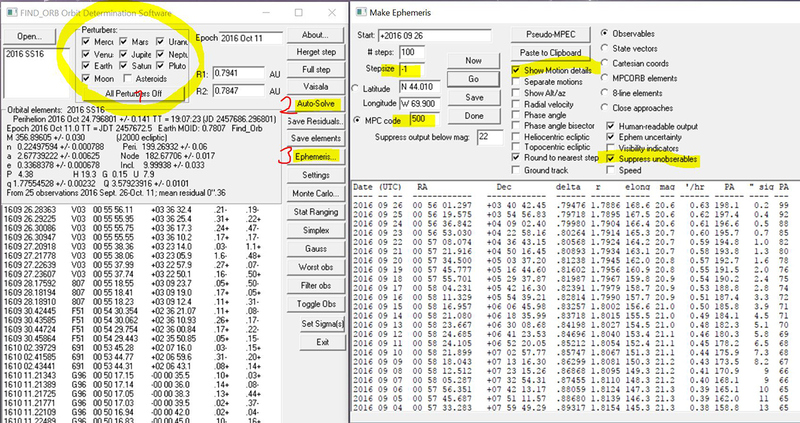 Use find orb to generate an ephemeris file with these exact settings. Enable all Perturbers -> Autosolve -> Generate Ephemeris. It is important to only go BACK in time from some date. You can start from any date, but always set the stepsize to -1. 5. After you have generated the object-ephem.txt file, and have downloaded the MPC's itf.txt or UnnNum.txt file, you are ready to start. (Do not modify this file in any way). - NOTE: A strategy that works well for short arc asteroids is to look for recent observations that were missed, within the months before the first published observations. If you can find them there, the orbit solve will become better, helping you run more accurate ephemeris further into the past looking for more lost observations. 8. It will then trim the very large itf.txt / UnnNum.txt file down to a smaller file called "obs-trimmed.txt" and load this file's path into the TRIMMED ITF: field. 9. For better formatted output, enter the packed designation of the objects you're trying to recover observations from. This will make the copy / paste faster while checking observations in FindOrb. 11. The obs-filtered.txt file will contain all possible candidates found that *could* be the asteroid. You'll now have to run them against the asteroid's known measurements in FindOrb to look for a match. TIP: If you find a match, look inside of the obs-filtered.txt file for the match, and look at the LOV value at the bottom of the file. Other objects that match will have a very similar LOV value. If you know the LOV value, you can enter it in the LOV field with a + / - setting (EX. -1.9 and 0.2) and click FILTER ITF/ UNN again. This will filter the file even further. Check each object carefully to ensure it is a match before submitting to the MPC. 13. If you format your final (matched) obs exactly as shown, with one empty line between each set after using the packed designation above to generate the obs, you can use ITF Search to generate the final MPC report. Make sure you have generated the orbit in FindOrb. Enter the packed designation you are matching isolated tracks to, select your file with the final matched obs formatted as shown, and select the FindOrb directory. You can then auto generate the report to send to the MPC with "BUILD REPORT".